Would you like to watch your favorite TV shows lying in a relaxing hot bath? Why not? 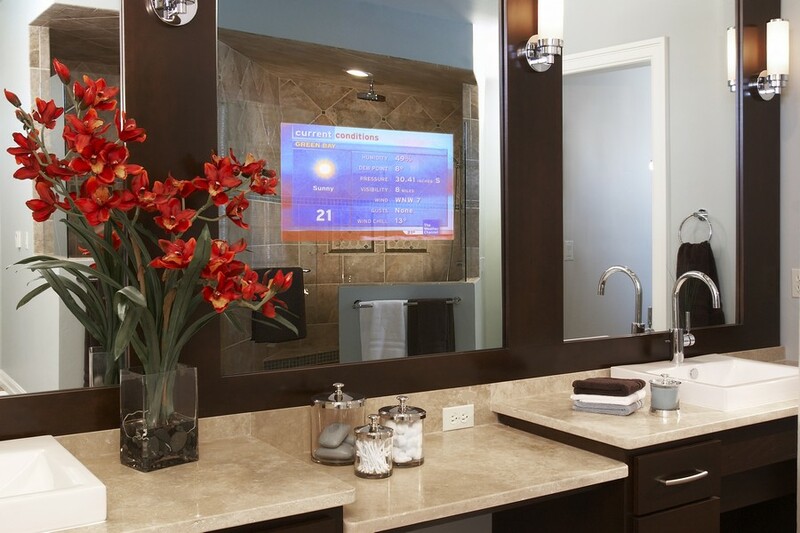 Today we’ll give you a few tips on how to install a TV-set in a bathroom safely and what drawbacks this undertaking might have. 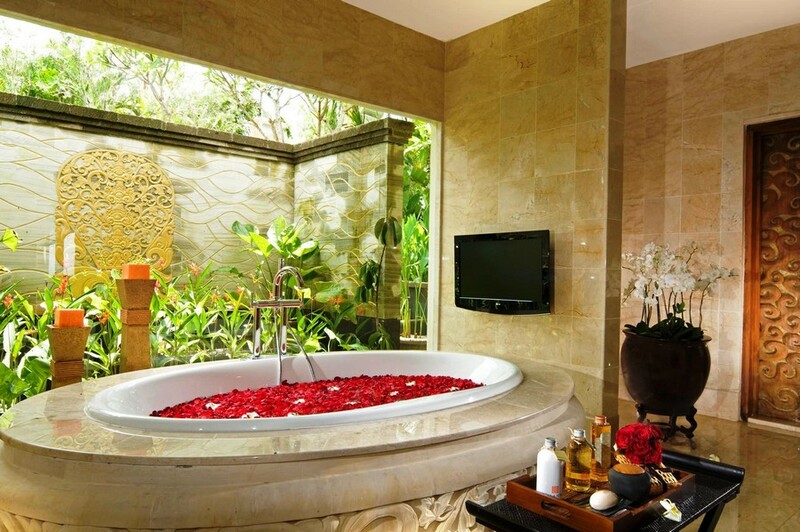 If taking a bath after a long difficult day you still can’t take your mind off daily routine or get away from some obsessive thoughts, it would be a good idea to have a TV-set installed in your bathroom. This will make the relaxation process more enjoyable (unless you are determined to watch horror movies or thrillers), and you won’t miss a new episode of your favorite show. 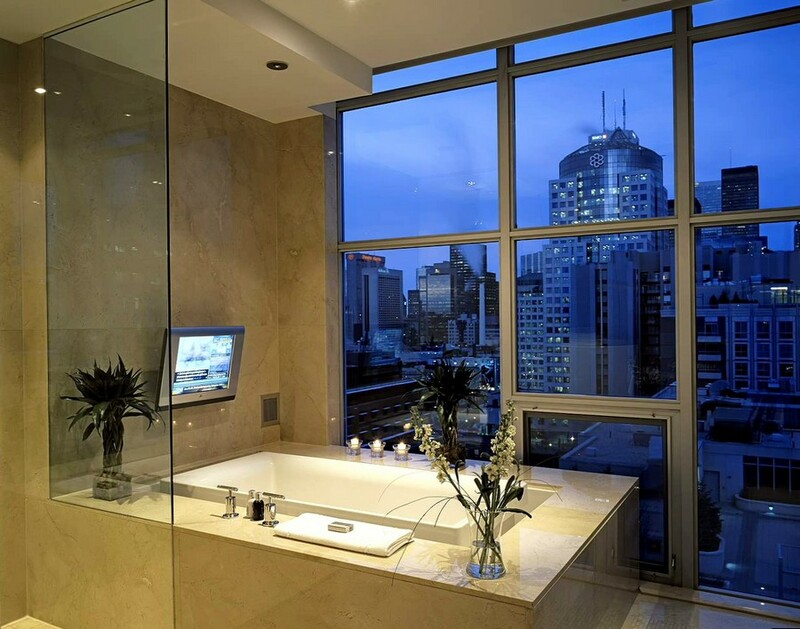 If you’re still wondering whether you should install a TV-set in the bathroom and trying to figure out all the pros and cons of this venture, this article is just for you. A TV-set must be dustproof and water-resistant, with a waterproof rating of at least IP 65 – this means it must resist not just splashes, but even direct inputs of water. 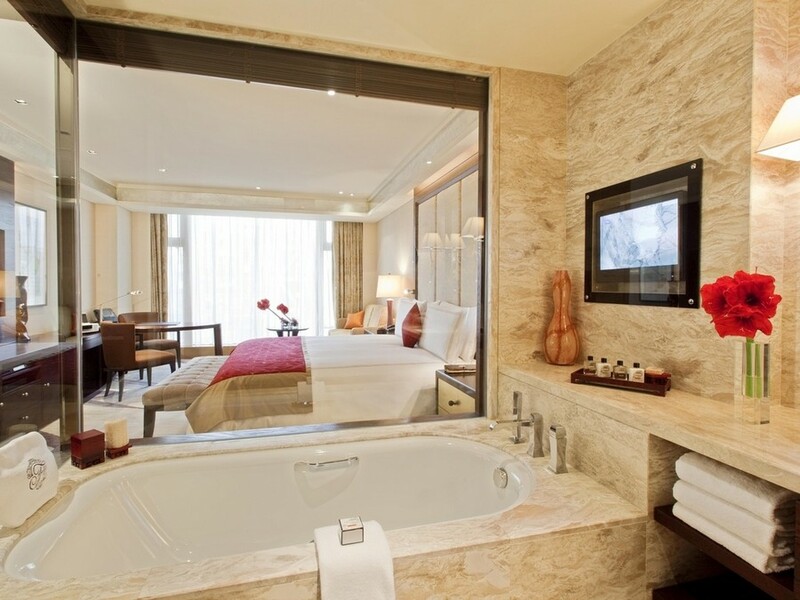 Professional architects recommend that a TV-set shall be flush with the bathroom wall. In this case you should envisage a wall niche considering the diagonal length of your appliance, an installation box and a technical trapdoor for maintenance. Buying a TV-set for your bathroom, don’t forget that a remote control must be also waterproof. When projecting the spot for installing a TV-set, you should mind a convenient angle of aspect, which will allow for enjouable and comfortable watching. Choose the right sound format. 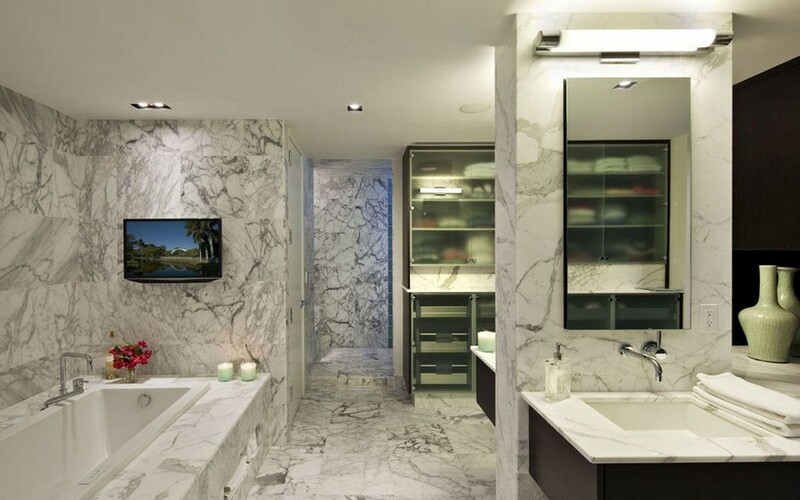 Pay attention to TV-set models with incorporated acoustic systems – they’re better for bathrooms as you don’t need to install speakers additionally. 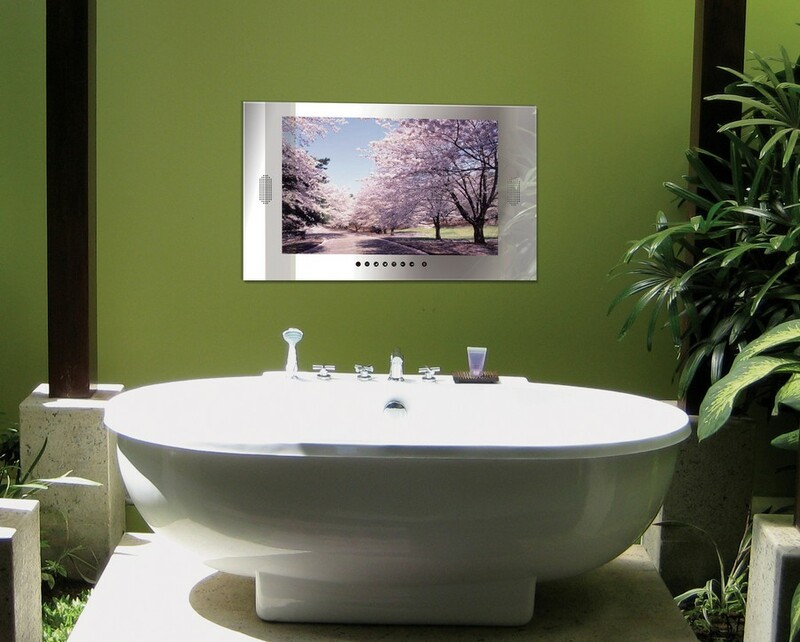 An interesting option is to have a mirror TV – a TV-set incorporated into your bathroom mirror. These models have become increasingly popular in the world of interior design. Firstly, it’s a quite costly venture. This is explained by the fact that bathroom TV-sets are completely hermetic blocks. In their production manufacturers apply innovative technologies that would let them survive in harsh conditions. Consequently, such an appliance takes many expensive elements to assemble, which results into a high price. Secondly, if the TV-set you installed initially breaks or you would like to replace it with a newer model, there is a great chance that you’ll have to renovate the bathroom again.